Step 1: Listen to the Match Committee Podcast. Step 2: Soak up all the DFS tips in this week’s article. Step 3: Load up Moneyball. Step 4: Profit! 112 points from 20 touches and 12 tackles sounds pretty good, right? That’s what the oft-injured Scott Selwood ($6,100 MID) had in the VFL against Bombers last week, earning his recall to the senior side. Scooter suffered an equally ill-prepared 2016 season, but his last three scores were still 104, 85, and 83; so when they say he’s ready to come in, he’s ready to come in. Based on last year, he’ll probably ease into it with a loose tag, which is more worrisome for the scoring of the player he tags rather than his own output. Price is right. Geelong conceded 7 tons in last week’s loss to the Bombers, but the interesting thing is, those 7 Bombers were the exact 7 highest-averaging Essendon players for the year. In fact, Geelong’s averaging the most 100+ scores against this year, and they’re all going to the expected players. Essentially, you get what you pay for when team play the Cats and that’s where you should be funneling your salary this week. 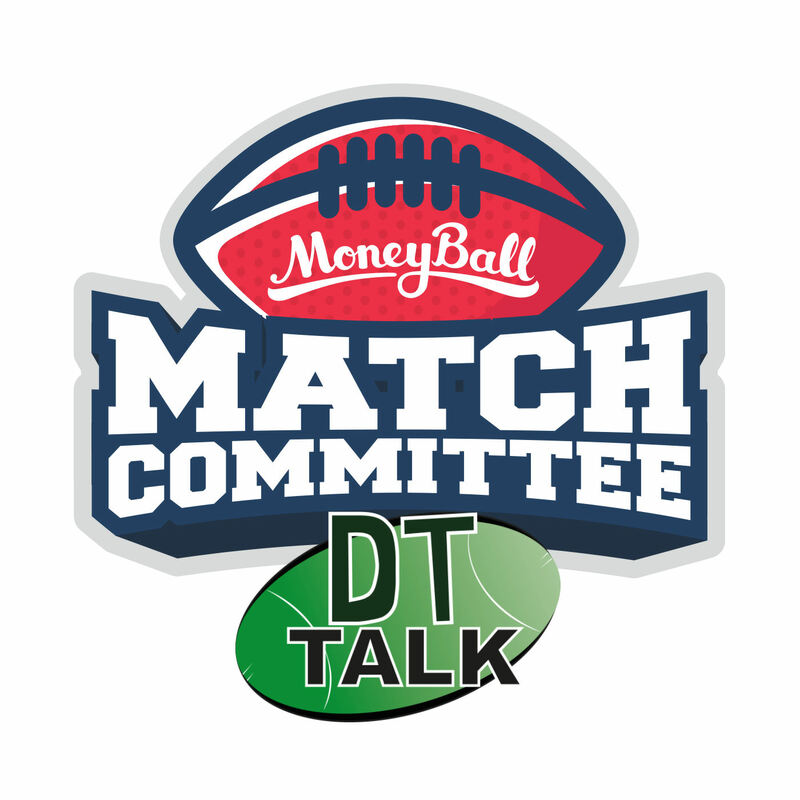 Marcus Bontempelli ($10,100 MID), Lachie Hunter ($9,200 MID), Jackson Macrae ($9,500 MID), and Dahlhaus ($9,200 MID) should be your targets in this game. Lukas Webb ($4,500 DEF): His 86 last week was a career-high from 16 games. However, VFL form has been excellent so Webb might be in the midst of a break-out year for him personally? Worth a gamble at that price. Mitch Duncan ($10,100 MID): If 91 is considered a “bad” game for Duncan, then why wouldn’t you go back to the well? A gun and will never be tagged while Danger and Selwood are hanging around. Caleb Daniel ($7,500 MID): This little guy had produced 103, 73 and 101 in last three, so he’s working into the season after a slow start. Isaac Heeney ($7,500 FWD) has pumped out eye-popping totals of 120, 102 and 118 in his last three efforts – and that’s still while playing a lot of time in proximity to the big sticks. Basically, he’s still way too bloody cheap and you’re a fool if you’re not on board. St Kilda give up the most points to defenders this year and Nic Newman ($5,500 DEF) is one of the few ‘scorers’ out of Sydney defence that could capitalise on that trend. Actually, he might play an even looser role (like he does at NEAFL level) now that Dane Rampe is back. Newman stole that show with 135 last week, thanks to 35 touches, 11 marks and 4 tackles. Billy Longer ($5,000 RU): Sydney are ranked #3 at conceding points to first rucks, so Longer could be worth a low-risk gamble that he can score more than 60 for a change. Jack Billings ($8,300 FWD): A breakout year by anyone’s measuring stick, Billings has 116 and 152 coming into this one. Averaging 8 tackles over his last 5 games is a big reason for his surge. Koby Stevens ($7,700 MID): Suspended last week but had 106 and 108 before it. Could be a nice POD, because he won’t be sitting at the forefront of this minds of your competitors. Could Dustin Martin ($10,100 MID) be that guy that bucks the scoring drought against the Giants? The numbers suggest he’s a red hot chance. Dusty’s last five scores against GWS make for pretty reading (132, 111, 74, 132, 112) and he has that ceiling that all the girls croon over with 3 scores over 125 already this year. With no possibility of a Coniglio tag due to injury, Martin is your best bet out of the black and yellow this week. As for his teammates; well, it’s not looking good. Over the past 5 weeks, Richmond has conceded the most fantasy points of any team, while GWS has conceded the least. So it goes without saying that you should be stacking your GWS players in this one, if you dabble at all. In his current form, Josh Kelly ($9,500 MID) is a must-have. 111 and 162 sit proudly in his last two, although it’s worth mentioning that those scores were while Coniglio was back in the side. Nathan Wilson ($6,200 DEF): Since Haynes went down, Wilson has scored 81 and 100. Could be a cause-and-effect going on there and worth a gander for the scoring boost. Tim Taranto ($5,500 MID): Price is nice and low due to early sub-60 scores, but 82, 62, 73 in last three is excellent for his salary. Daniel Lloyd ($3,800 FWD): Showed enough last week with his 61 that he can be a nice basement buy while his price remains so juicy. Tex Walker ($7,400 FWD) is this week’s focus with the Brisbane Backline Rule, especially after it paid off last year as he pumped out 126 (12 marks and 4.1) against the Lions. This year, in games where Tex has kicked 4 goals or more, he’s averaged 106 – and that was even tastier at 119 per game from a bigger sample size last year. I’ll be riding Tex hard this week in what is the biggest serving of free cash you can get on the legal market. Also, Tom T Lynch ($8,400 FWD) had 139 from 15 marks and 4 goals in same game versus the Lions last year. Lynch is such a vulture that he’s always worth a look whenever Adelaide expect a big win. However, Jenkins has been given the boot this weekend and our best bet is that he’ll head back towards the big sticks and hence, worthy of your salary again in Round 9. Rory Sloane ($10,700 MID), on the other hand, is a big fade target this week. He’ll 100% be tagged this week after recent struggles, and his likely foe in Robertson held the dangerous Isaac Smith last week, holding him to 62 last week. Sloane has proven himself to be highly susceptible to a good old fashioned taggin’, limited to 65 (Gibson) and 63 (Vince) in last fortnight. Ryan Burton ($6,100 FWD) has produced 3 scores in the 90’s in his past 4 games, and that kind of production is way over what his price implies. Burton’s been playing that switch kick role in defence and Collingwood have given up the most points to defenders in the past 5 weeks. I sense a little bit of synergy here folks. The Cox Handbrake is clear, so where do we sit on Brodie Grundy ($9,900 RU) this week given these splits? Thankfully, Bucks has opted to leave out the American Pie despite strong VFL form, so we should be seeing Grundy in full force this week – if the above stats are any indication, he’s heavily underpriced with a four-figure salary. Liam Shiels ($7,700 MID): The Pies give up the 2nd most points (over the last 5) and Shiels is coming off 120. His consistency leaves a bit to be desired but the ceiling is there, which we love for our GPPs. Will Hoskin-Elliott ($6,300 FWD): Forecast says no rain, so feel free to pick up the dry-weather specialist. Luke Hodge ($8,900 MID): Playing that trademark rebound role, boasting 106, 90, and 109 in his last three. Unsurprisingly, a big reason for Hawthorn’s return to the winner’s list. West Coast rank 3rd for conceding points to opposition #1 ruckman over the last 5 weeks, which puts Matthew Leuenberger ($7,000 RU) on the menu. While Leuey is out of form with a pair of 60’s lately, a friendly Vardy/McInness combo is the perfect way to get back into it. Leuey averaged 88 over the first few weeks, and I expect him to nudge that figure this Sunday. How can you say no to Zach Merrett ($11,400 MID)? The Pig Incumbent has an oinkworthy last two scores of 137 and 123 against the Eagles, and is averaging 131 in last the last five weeks – second only to Rocky. As we said last week, West Coast like to play an uncontested brand and Merrett is ranked 4th in uncontested possessions at 22 per game. Speaking of uncontested possessions, Andrew Gaff ($9,500 MID) is ranked #1 at 25 per game and is fresh of 146 last week, which included 35 touches and 15 marks. He’ll be a solid pick if these two midfields go head to head as expected. Fraser McInnes ($4,300 FWD): Played an important role for Eagles last week, giving them more than Giles has been thanks to his versatility. 74 from a modest 15 hitouts, playing second fiddle. James Stewart ($3,800 FWD): Won’t set the world on fire, but you take 70’s at his price. Can help you reach the top-end talent. Dom Sheed ($6,600 MID): The ultimate GPP pick because of his inconsistency with a high ceiling. Has gone 99, 48, 103 which is a great snapshot of his career. Always a gamble. Here’s what Melbourne have allowed to ruckmen recently: Bellchambers (91), McEvoy (124) and Jacobs (132), who casually had 74 hitouts last week! So yeah, you’re picking Todd Goldstein ($8,700 RU), even if he’s had three weeks of “only” 90’s in a row. It’s a no brainer and honestly, the numbers are so of the charts that you basically can’t win without him. North conceded 8 tons to bottom-of-the-ladder Sydney last week, 6 of which were to their “out of form” midfield. Serious midfield issues for the Roos, whereas Melbourne, on the other hand, rank #2 for total disposals. In fact, they boast 5 midfielders who average over 94 fantasy points. I know who’ll I’d be targeting in this one – it’s Demon MIDs all the way. Jack Viney ($9,200 MID) is at the top of the list after going 145 and 132 in last fortnight. Cam Pedersen ($6,300 FWD): Reaching must-have status. 98, 97 and 94 this year, averaging 19 hitouts but getting it done all around the ground. Clayton Oliver ($8,700 MID): Ranked clear #1 for handballs in the league at 23 per game, and North concede the 2nd most handballs to opponents out of any team. Ben Cunnington ($7,300 MID): One of North’s only midfielders who can keep his head held high. Averaging 92 in his last five, including 4 tons. Brad Hill’s ($8,600 MID) racked up 27 marks over the past two weeks, insane figures for a midfielder and definitely worthy of some analysis. 159 and 123 are his scores in the last fortnight which has come without his brother Stephen in the side. What’s amazing is how he wins his possessions – over the past two weeks, he’s had 61 uncontested poss, but only 5 contested! Freo love getting the pill in his hands, and we love picking Brad in our Moneyball teams as a result. Fremantle are ranked #18th for conceding points to opposition starting ruckmen, so despite strong form (97 average in L3), it might be worth fading Matthew Kreuzer ($8,200 RU) this weekend. In fact, Fremantle is Kreuzer’s worst team to play against over his career, averaging just 58 points against them with a high score of just 84. The Sandi factor is obviously a huge reason for that, so I’ll be staying away this week. Michael Walters ($6,700 FWD): Almost a lock given that he’s played his last 6 quarters in the midfield. 88 and 137 in the last fortnight, and he was clearly BOG last week. Will be hard to kick him out of the guts, even by Ross Lyon’s standards. Patrick Cripps ($10,000 MID): He’s back. 121, 117, 100, and 143 in his last four. Jump aboard! Caleb Marchbank ($6,000 DEF): Three 80’s in a row for the rookie. Easy pick, very safe as he’s scored between 67 and 89 in every game this year. PS always miss the bullets which was a great read!!! Scooter has remained my Twitter background all this time, and I’m not going to stop loving him because of some silly injury! I’ll never forget the good times – the gaudy 120’s, the cheeky junk time, and the incredible improvement he made every year. Mark my words… He’ll be back.